I try hard to maintain good habits, starting first thing in the morning with an easy, healthy breakfast. First I walk about seven miles almost every day. Then I come home and make a healthy breakfast. 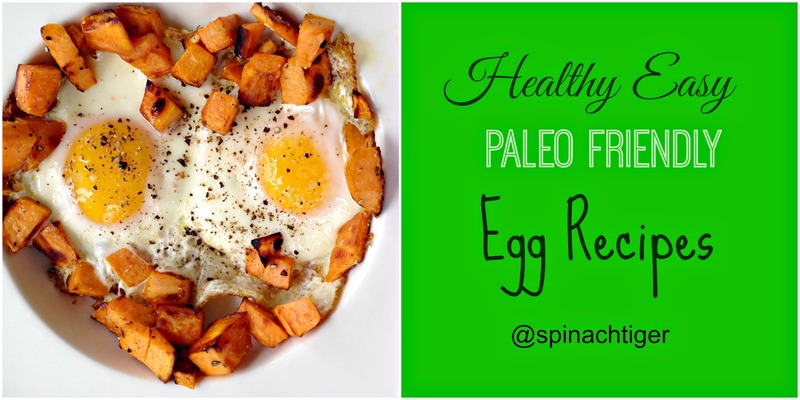 I need easy, healthy recipes usually with eggs, because I want the protein eggs provide. I also love runny yolks, which make me feel like I’m eating something rich and decadent. 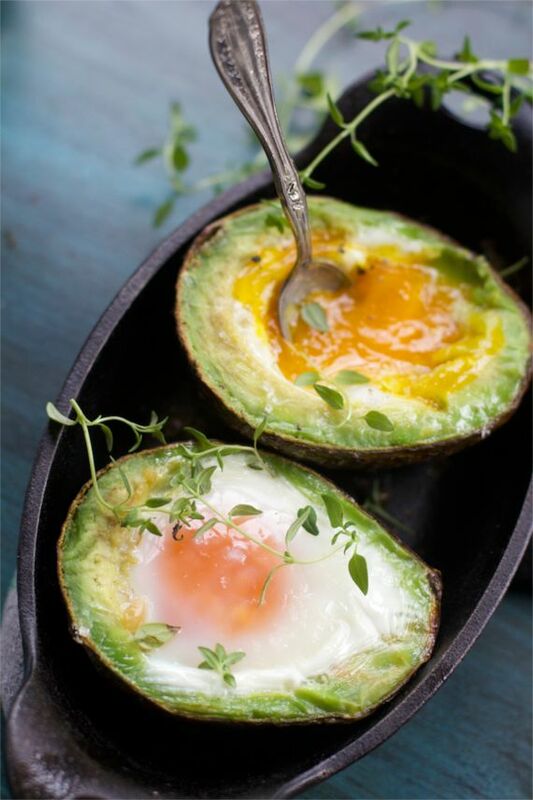 Most of these easy, healthy breakfast recipes are Paleo Friendly and designed to give you lots of energy throughout the day without feeling hungry. 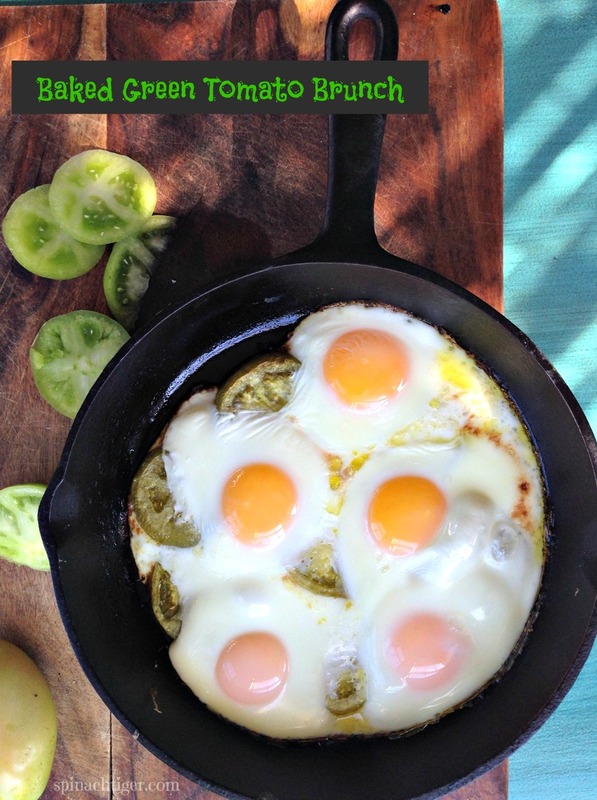 If you’re looking for innovative ways to cook an easy healthy breakfast recipe, whether you are cutting grains out for a day, weekdays in general, you can count on oven fried sunny side up eggs as one of the star ingredients. I discovered this egg making technique quite by accident last year, and now it’s my go to breakfast/lunch or brunch. It was sheer coincidence that when I emptied the sweet potatoes into the dish, they shaped a heart. Easy Recipe: Cube half of a sweet potato. Toss with olive oil. Roast for 15 minutes at 400, turning at 7 minutes. Add two eggs. Bake at 425 for five minutes. 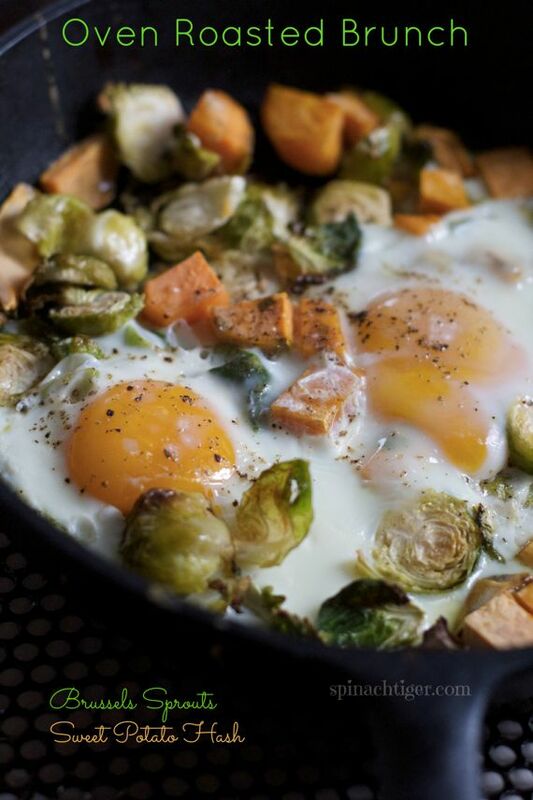 Brussels Sprouts Sweet Potato Hash will make you feel like royalty. 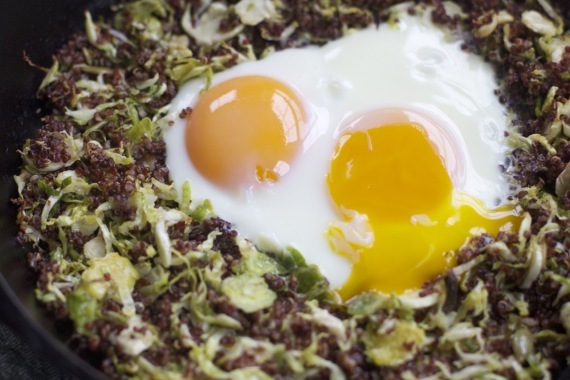 Super food Breakfast: Red Quinoa, Brussels Sprouts. Make that part the night before. Slip those eggs into an avocado. HEALTHY fat, great protein. Recipe here. 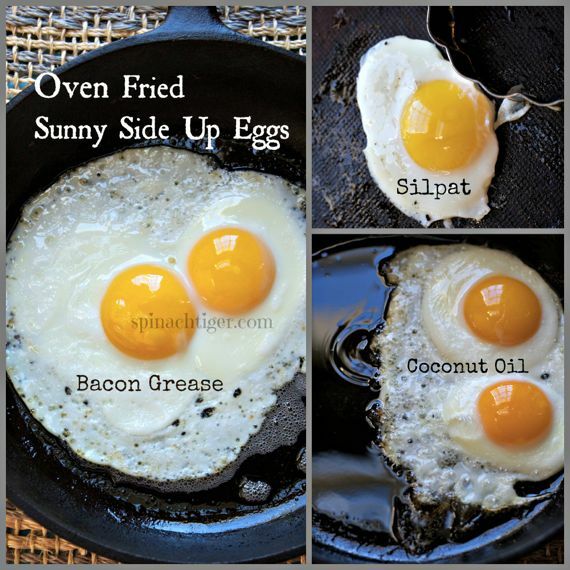 If you don’t want to oven fry your eggs, I have the secret to perfect poaching. 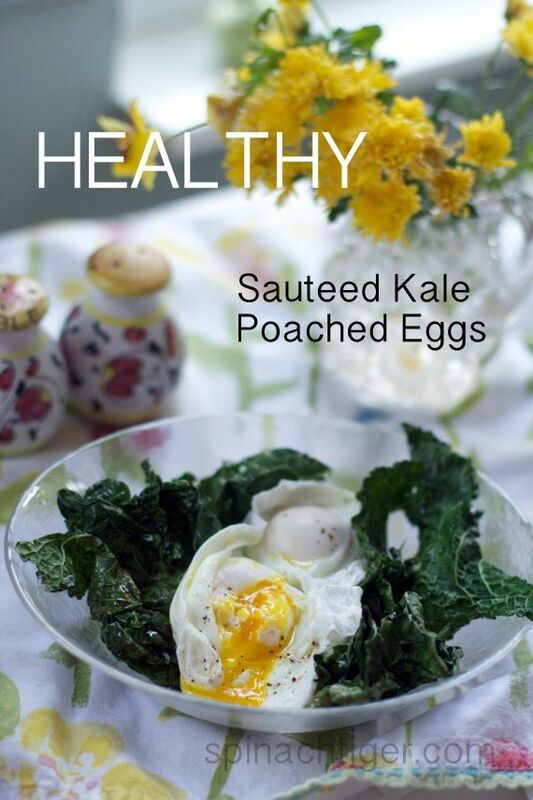 Sauteed kale with poached eggs takes no longer than ten minutes to prepare start to finish. I adore peas and I think you can eat them for breakfast. Sweet and hearty. 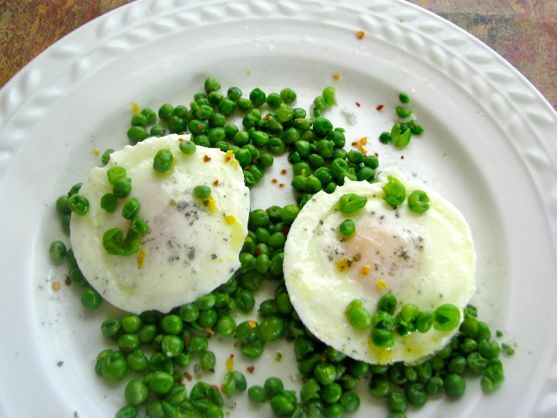 Peas with poached eggs. 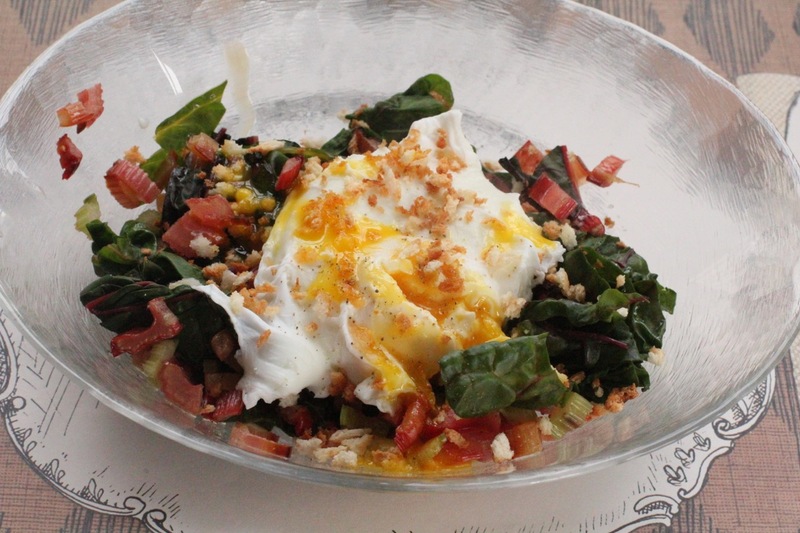 Swiss Chard, bread crumbs, poached eggs. Healthy and so pretty. Salad is not just for lunch. 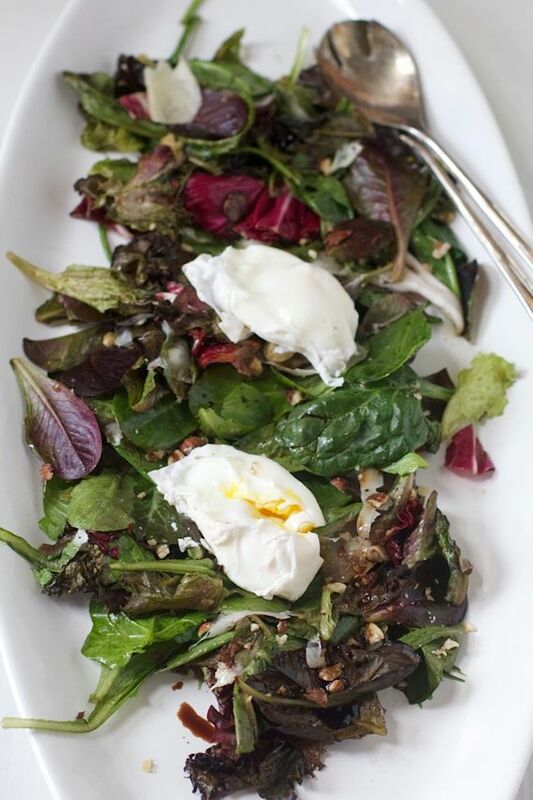 These greens are roasted with hazelnuts and pecorino make for a very healthy breakfast. 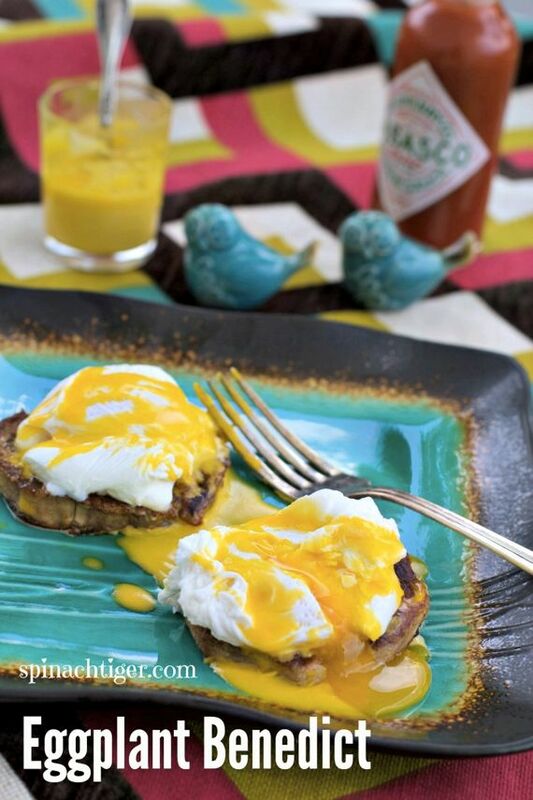 Here is a paleo friendly eggs benedict made with eggplant. Not as easy as some, but a very straight forward recipe. 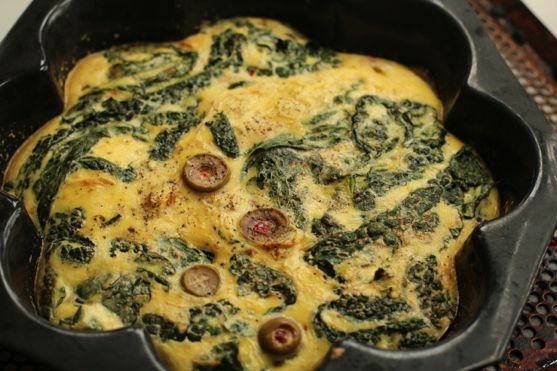 Kale, green olive frittata is easy because you bake it. 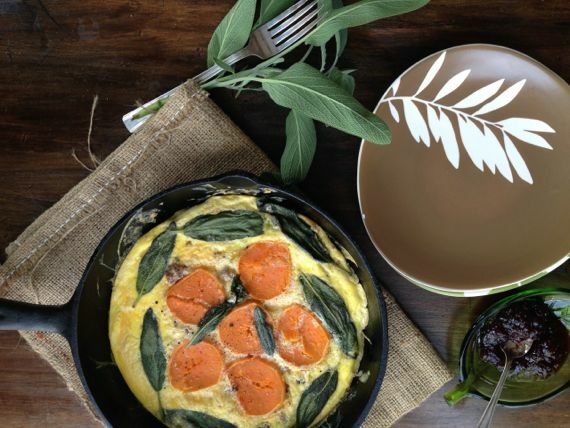 Using a similar technique, add sage sausage and sweet potatoes to make this twenty minute baked sweet potato frittata. This is a breakfast that easily becomes dinner. The sausage is lean and there is no cheese. I hope you get some inspiration from these great easy, healthy breakfast recipes. 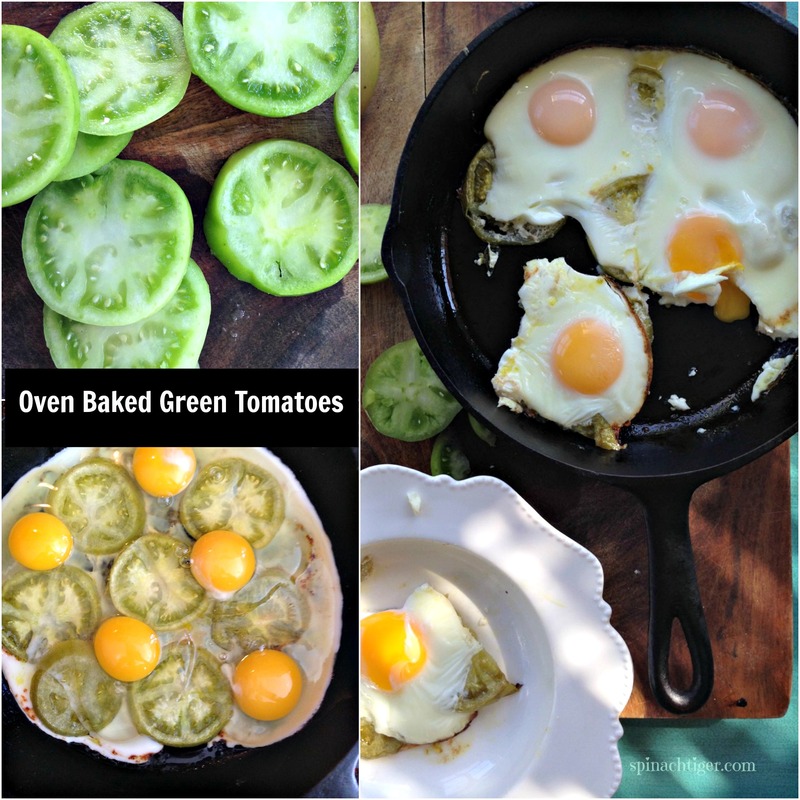 Paleo friendly, baked green tomatoes with baked eggs. Add oil to cast iron pan or baking dish. Just enough to cover bottom. Turn temperature up to 400. 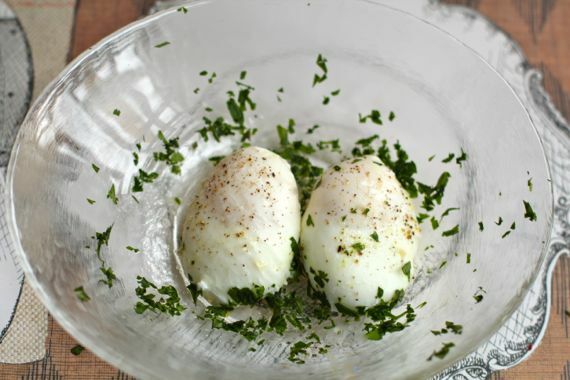 Bake eggs until done, 7 - 10 minutes. Breakfast is my favorite meal and I eat eggs nearly every day. You’ve given me lots of ideas to consider, especially the green tomato one. I designed it myself with lots of input . Took 20 renditions. Still working on other parts of the site. Heart-shaped brunch, for meeee? You shouldn’t have! I’ve never even considered using my silpat for eggs. Great idea! Although, like you, I am all about some greasy skillet cooking! Haha. Thanks Phillip. The heart shape always wins.